By 2.30pm the crowd at Free Derry corner had swollen and spread towards the Bloody Sunday memorial. The Bogside nestled below the city walls basking in warm summer sunshine. Stewards shepherded members of the Bloody Sunday families and other victims of state killings, like the Ballymurphy families, to the front of the mass of people. Eleven people - ten men, including a local priest and a mother of eight children - were killed in Ballymurphy in west Belfast by the parachute regiment in the 36 hours following the introduction of internment in August 1971, six months before Bloody Sunday in Derry. There was a good natured sense of expectation as thousands of people fell in behind the families. The names of the 14 victims were read aloud. There was a minute’s silence. Then we set off for the Guild Hall, the destination of the original civil rights march thirty eight years ago. As we passed Pilots Row Community Centre someone started to sing ‘We Shall Overcome’ and I was swept back over forty years ago. ‘We shall all be free. In the Guild Hall Square the crowds cheered loudly as family members ensconced inside the city chambers reading the Saville Report, waved copies of the report from the stained glass windows and gave thumbs up signals. We knew then, even before listening to the British PM speaking from the Parliament in London and relayed live on a big screen, that the families felt vindicated. Today was their day. Today was a day for those killed and injured. Today was a day for those who campaigned for almost forty years for truth and justice. And when they trooped out of the Guild Hall they were greeted with a rapturous welcome. Tony Doherty whose father was killed by the Paras put the families feelings well. 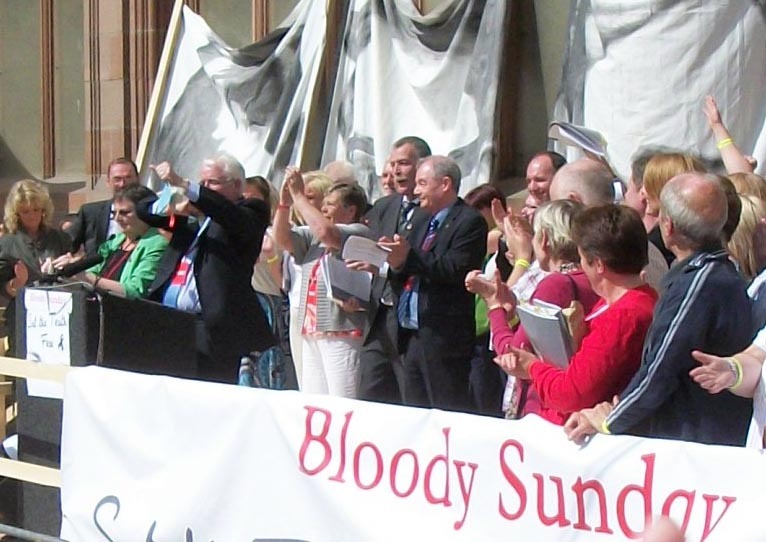 ‘The victims of Bloody Sunday have been vindicated. The Parachute Regiment has been disgraced. Widgery’s great lie has been laid bare. The truth has been brought home at last. It can now be proclaimed to the world that the dead and the wounded of Bloody Sunday, civil rights marchers, were innocent one and all ….. The Parachute Regiment are the front line assassins for Britain’s political and military elite. The report of the Saville Tribunal confirms this……..
…… democracy itself … needs know what happened here on January 30th 1972. The British people need to know. The Irish people need to know. The world needs to know. Just as the civil rights movement of 40 years ago was part of something huge happening all over the world, so the repression that came upon us was the same as is suffered by ordinary people everywhere who dare to stand up against injustice. Their remarks were interrupted by loud applause. People cried and cheered. And cheered and cried. Clenched fists stabbed the air. Not the clenched fists of young radicals. These were elderly Derry grannies and grandas. Elderly widows. Middle aged siblings. At the end one of the women relatives tore up a copy of the Widgery Report and flung it to the wind. Widgery was part of the British state’s cover-up of what had happened. A lie it stuck to for decades. I picked up some of the pieces afterwards and placed them in my copy of Saville, a keepsake of a remarkable day. On the way home some one had placed hundreds of little name plaques along the grass verge at the side of the road outside Dungiven. The names were of hundreds of citizens killed by the British army and other state forces here during the conflict, including the 11 from Ballymurphy. I like the Torn Widgery document, a very nice touch Gerry,keepsake,relic of the past. Seems so hard that it come down to this, the lie stuck to for decades, like so many others. I was reading on David Cameron's comments on Martin McGuinness, "A Degrees of pain" seems a small price compared to the families/victims of Bloody Sunday. A 5,000-page report about , deeply sorry ,old boy, next time we will do better,just don't cut the cake. A little slaughter now and than happens,the truth has now been delivered. But the Truth of the Truth has yet to be delivered, for every act of discovery advances the art of discovery. Long range planning does not deal with future decisions, but with the future of present decisions.~Peter Drucker. Today is the first day of the future planning, let us hope for a better future. After the recent gun rampage in Britain by Derrick Bird who massacred 12 people, within hours we were constantly reminded of the events and the word murder and murderer where used over and over again by the British press and numerous comparisons made with Dunblane and the bloodbath in Hungerford... Even after nearly 40 years can`t the people of Derry be given the same decency as to their gun rampage and Murder of innocents... To Britain and their Army in Ireland... Why dont you go home !! It was a momentous and sensitive day for the people of Derry as their freinds and family members were finally exonerated. Middle class Unionism and upper middle class unionism (those who formed and ran/run the state) in my eyes, distance themselves form the conflict and deem themselves paragons of virtue. I hope that those who stir the sectarian pot fade away into their bile filled past. This place has a great potential, and one day I hope to see the butchers apron took down of city hall, as it flaps around today like an old colonalist, in the dying embers of empire. And aye, the weather is great these days. Although living in a tiny village in Spain I keep in daily contact with anything relevant in all of Ireland. It gives me immense pleasure to know that the Peace is being monitored all the time and that dissidents and other vested interests are being shown the door by the average citizen as well as capable politicians.